Local girls from the 6th through 10th grades in the Buffalo area learned about careers in computing and technology Saturday at the downtown library. 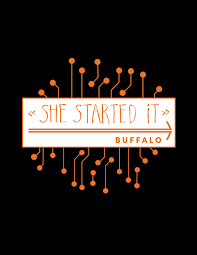 A free event called "She Started IT" featured female entrepreneurs who shared their experiences. Event organizer Hadar Borden said it's important for girls to realize that they, too, have a future in the tech industry. "We brought in speakers so that the girls would have an opportunity to interact and be inspired by women who work in the tech industry," Borden said. The participants Saturday were able to watch a demonstration of a 3-D printer and had several other hands-on experiences. Borden said it's important for these girls to see the "world of opportunities" that await them.